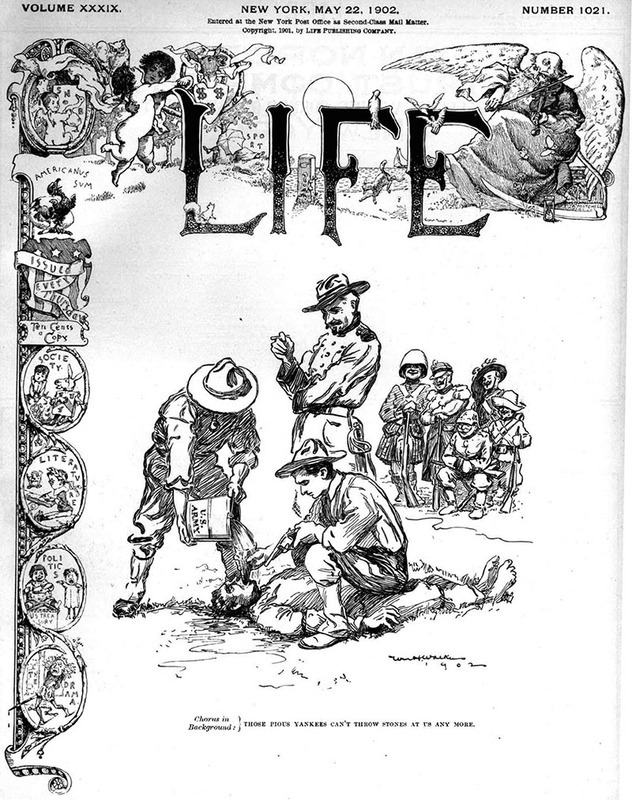 The American occupation of the Philippines from 1899 spawned a widespread indigenous resistance whose “hatred of our people is as bitter as it is groundless,” one American general puzzled. Cartoon on the cover of Life magazine’s May 22, 1902 issue (click for larger image) shows colonial European powers chortling, ‘Those pious Yankees can’t throw stones at us any more’ as they watch Americans apply the water cure to a Filipino captive. Torture by water cure was widespread during the Philippines-American War. Apart from guerrillas in the field, Filipino insurgents opposed the occupiers’ superior firepower with the nasty asymmetrical tactics of assassination and terrorism, and that’s what brings us to today’s post. Filipino terrorists known as Ducots, Mandoducots, or Sandathan on August 28, 1900 murdered a wealthy Los Banos landowner named Honorato Quisumbing who served as a town “presidente” under the American occupation. The decedent was a Visayan doing business as a merchant at Santa Cruz and Los Banos … formerly loyal to the Spanish Government and transferred his loyalty, active assistance, and cordial good will to the succeeding Government of the United States … Because of his friendshipfor, and willingness to aid, the forces of the United States, he was made a marked man, and the order went forth from the insurgent chiefs that he should be secured, dead or alive; and, as the sequel shows, a money reward was offered for his life. General Arthur MacArthur — father of World War II General Douglas MacArthur — commuted four of the sentences to prison terms, and approved the remaining five executions for April 5, 1901. Honorato Quisumbing’s widow was compensated by American authorities to the tune of $1,500. One of the victim’s seven sons, Eduardo, grew up to become his country’s leading botanist. Further north on Luzon that same date, the pueblo of Mexico witnessed the hanging of insurgent captain Isabello del Rosario, also by authority of the American military government.